The staff of the Youth Services Department invites you to join us in the wonderful adventure of helping children learn to love books and reading! 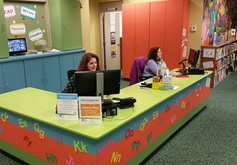 The Monroe Public Library Children's Department serves youth of all ages and everyone who cares for them by encouraging curiosity and diverse literacies through learning, creativity, and play. Join us for special events and ongoing programs for kids of all ages. Literacy tips and activities to help your child get ready to read, plus booklists for independent readers and app recommendations for all ages. Find book lists and reading suggestions!